They are inseparable from sun up to sun down. One man and one dog carrying out a healing prescription. "This dog has become my life, I cannot function without him, cannot function without him," says Richard Wengroff. Richard and Shelia Wengroff are the proud owners of 10 month old "Ozzie." The shar pei, lab mix is medically prescribed by Richard's doctor and psychologist for depression and anxiety. Just about the time "Ozzie" arrived so did a controversy. "Horrible, just a horrific experience, I have never in my entire life experienced people like this," says Sheila Wengroff. Sheila speaks of Century Village's Wellington "K" Condo Association which has a "no pets in condo" policy. They've been told "Ozzie" must go which hasn't settled well in Apartment #289. The couple hired a lawyer, wrote the Attorney General and turned to David Shapiro who heads up an organization called "Citizens for Pets in Condos." almost to deprive people of a needed medication, it would be as though they are saying you cannot take a certain medication," says David Shapiro. The Wengroff's are one of hundreds of cases across South Florida where condo boards and medically prescribed pets are clashing. 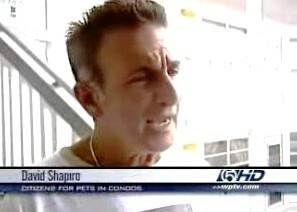 Shapiro has gathered 15 thousand signatures, has been to Tallahassee and has watched more and more people challenge condo laws hoping for a reasonable reform of existing laws to keep "prescriptions" in place. "This is my medicine, this is everything that I need, my sons are off on their own, my wife works, he is my salvation," says Richard Wengroff. And he will continue to be, he says, with or without the support of their condo association. 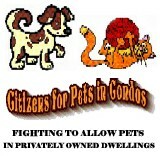 If you would like to find our more about Citizens for Pets in Condo's" just log onto their website.